Using the spreadsheet from VK7TW’s Blog and leaving a little extra left over for fine tuning, I’ve been slowly putting together the antenna, using an antenna analyser to get the resonant frequency as close as I could to where I wanted it. The foam core was purchased to make the centre ring that slips over the tip of the squid pole. having broken one ring early on, this ring was made by sandwiching two pieces of signboard together with a liberal application of hot glue. RG-58 was then fed through holes to act as strain relief and the antenna wire soldered directly to the coax core and shield. 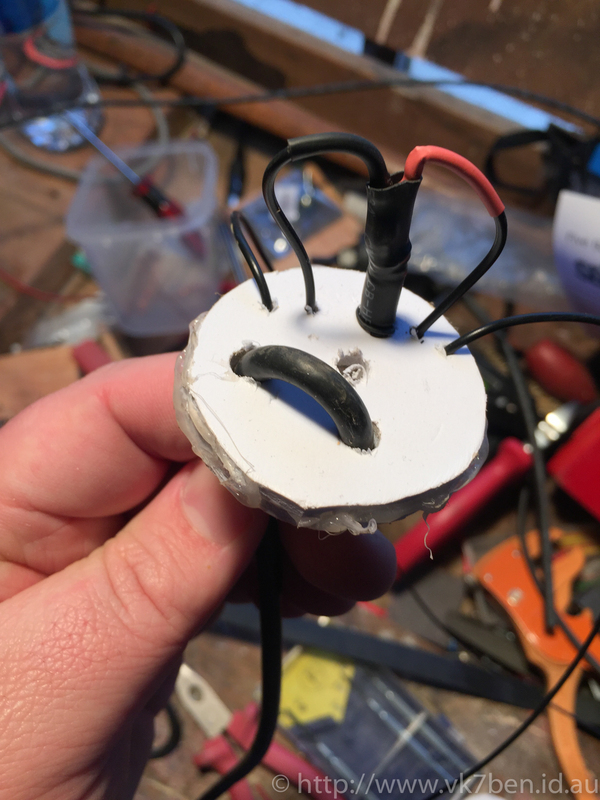 The foam core was also used to anchor the wire lengths to at each link and to make winders to wrap the the antenna up on in a way that doesnt take 15 minutes to untangle every time you deploy it. The antenna is going to be used with a Yaesu FT-817 which is a QRP radio capable of up to 5 watts. I chose to use the RG58 in this instance over RG-174 as the losses started to get to a level I was not happy with over 20Mhz for RG174. Perhaps my biggest challenge in construction was Murphy. I was amazed at the many combinations the feed line, antenna wire and builders line I was using to tie down the ends could get tangled! Picture says it all really. I swore a lot. I wont lie. mistakes where made. 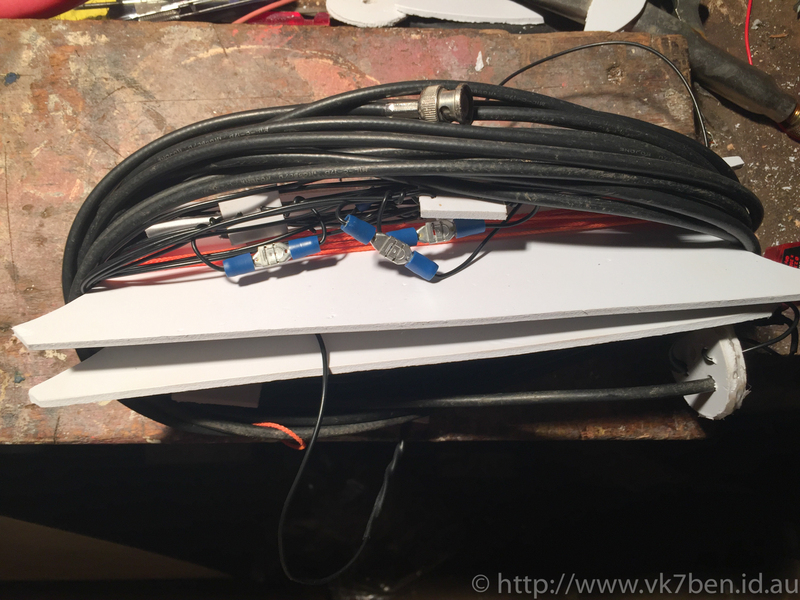 I had to solder wire back on in a couple of locations where the tuning looked fine until I made the cut, then found it was too short, so a rebuild of the dipole may occur in the future taking advantage of the lessons learnt. Total cost for antenna parts was around $17, with the squid pole being the most expensive item. This is a really effective antenna for the price, so hopefully I will be able to refine the build process a bit and make some more.